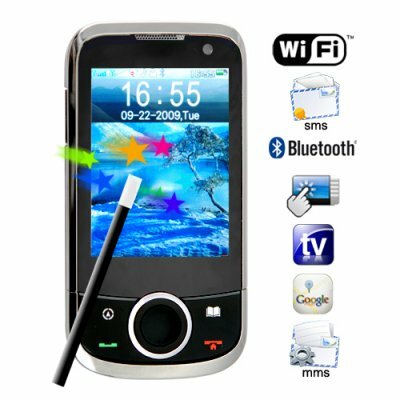 Successfully Added The Beatle - Quadband Touch Screen Dual SIM WiFi Media Cellphone to your Shopping Cart. The Beatle is the handy unlocked cellphone for this generation. Featuring Wifi, Google Maps, TV, eBuddy, MSN, Bluetooth, two SIM card slots, and global quad band GSM connectivity this a great phone for anybody who wants something cutting edge that they can use on a daily basis. A dual SIM dual standby phone that allows you to combine work and play. The Beatle takes you online wherever a hotspot or wireless connection is available - coffee shops, airports, libraries, etc. As long as you've got a WiFi connection you have a stunning array of web services like Google Maps and eBuddy at your fingertips. That's even before you take into Analog TV, FM radio and Opera Mini features. This is more than a mobile phone - it's a global communication and entertainment device. With a slide motion sensor and plenty of color icons, the front screen menu system is designed to make things easy for the end user. The motion sensor can be used to navigate within the main window with a simple slide of the finger or use with a stylus. The Beatle is a full-featured interactive cellphone coming with the best of entertainment and communication functions in one unlocked factory-direct cellular phone. The CVDQ-M58 comes enabled with a multitude of software PDA daily-use tools, making this small high performance cellphone ideal for phone calls, entertainment and productivity uses. Don't judge a book by its cover. The Beatle is built to be robust and with a long battery life and caters to the needs of every modern phone user. From simple phone calls and text messaging, to browsing the internet or watching TV, the CVSC-M58 (a.k.a The Beatle) will make sure you enjoy your music through the 2.5mm plug-in for headphones. In addition, the accelerometer feature is truly out of this world. Change songs, wallpaper, FM channels or TV channels all with one simple shake of thewrist. The accelerometer function supports portrait and landscape video viewing similar to the iPhone. Just turn the phone sideways and the screen will automatically change from portrait to landscape. If you enjoy personalizing your phone and having all of your most used functions next to each other. Then you're in for a nice treat. Hold down on any icon on the screen of The Beatle, and see them dance, after which you will be able to select any icon of your choosing and position them anywhere on the screen. Similar to the function of the iPhone, this feature allows you to position, settings, messaging, phone book, eBuddy, photos and any other application that you use the most, all right next to each other for even faster accessibility. This is a multimedia dual SIM with dual standby cellphone, simply engineered to perform effortlessly and cater to the personal and professional needs of the end use. The Beatle is in stock today, so order yours right away at an incredible factory direct wholesale price straight from Chinavasion. nice phone, need to play little bit with the phone for understand every thing. Delivery perfect.. Thanks for the transaction. I'm very pleased with the phone . Shipping and communication was perfect. Will definitly buy again. Great company , very trustworthy. same detail and software of chinavasion 'thunder' phone but smaller in size and screen but same great applications. on 2010-02-05 15:10:25 Телефон супер! Этим телефоном пользуюсь полгода. Работает замечательно! Полностью доволен этим аппаратом и рекомендую всем!